Das Fleur de Lys Diamant Diadem war eines ihrer Hochzeitsgeschenke, die Sie 1935 zur Vermählung erhielt. BEARERS OF QUEEN'S CANOPY - The Queen's crowning, though solemn and dignified, had all the grace and beauty of a ballet. Six trainbearers moved slowly in a circle round her, keeping the train outspread in a great pool over the golden carpet. Simultaneously, attendants swung the red trains of the canopy-bearers, making the whole scene glow with living color as the Crown was placed on the Queen's head. Then the white-gloved hands of the peeresses rose like white birds fluttering as they placed the coro-nets on their own heads. The panorama was splendid, and we felt we were sitting in a frame, for the built up stands suggested Ascot, or perhaps – more romantically – the tournaments of medieval days; the chairs were covered with blue velvet; the church atmosphere, I fear, had completely gone; we had an excellent view and we settled down to wait. I looked about me; on all sides were MPs I knew and their be-plumed, be-veiled, be-jewelled wives. Some were resplendent but my Honour stood out. The Peeresses began to take their places, the Duchesses in front, and in front of them the four of their Order who had been chosen to hold the canopy over the queen when she is anointed the same rich gold canopy previously held over the king by four peers. It is of beautiful cloth of gold, embroidered with silver in historic symbols and supported on four pillars with silver bells attached at the top. In 1937 the duchesses of Roxburghe and Norfolk are the youngest duchesses in England and are both brides. They are both tall and willowy, one dark one blond and they are both a little shy. It isn't known which of her famous and outstanding jewels the duchess of Roxburghe wore at the coronation, but it would be very fitting if she had worn her magnificent diamond tiara/necklace from the last quarter of the 19th century, which is pictured above. It is composed of fleur de lys and confronting scroll motifs, swingset with a graduated row of twenty pear-shaped diamond on a band composed of lozenge and trefoil motifs, set throughout with cushion-shaped and rose diamonds. Wearable as necklace of 485 mm, the tiara detaches to form a collier and a bandeau, the bandeau detachable into two sections of approximately 310 mm and 145 mm. The frame of the tiara is 430mm.The jewel is estimated to sell between $300,000 and $500,000 USD at the Sotheby's May auction in Geneva. Maybe the Duchess wore it together with her, important diamond riviére of the mid-19th century, designed as a graduated row of forty-three collet-set cushion-shaped diamonds on a similarly set clasp framed with single cut diamonds. length ca 465 mm. 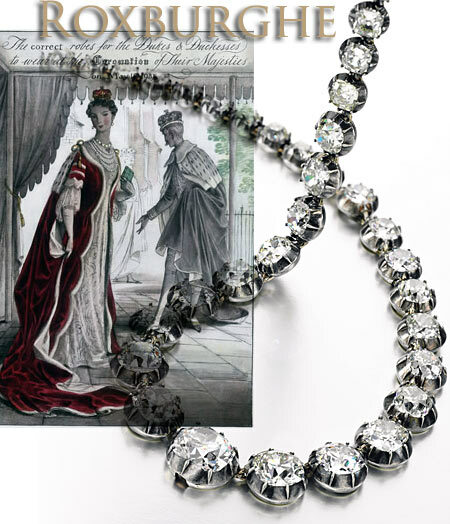 A diamond collet necklace is a basic piece of the nobility and aristocracy. Riviére is a term used to describe a necklace designed as a succession of gemstones individually set in simple collet or claw mounts without other ornamentation and often used as a synonym for a diamond set neck ornament. It is likely that the simple structure of the riviére was used for necklaces prior to the 18th century, but it was only in the second half of the century that riviéres came to the forefront of jewellery design. These were formed of a line of gemstones of graduated size and mounted in closed collets. By the turn of the century most riviéres were set with gemstones mounted in open collets which remained the typical way of mounting until the end of the 19th century. A distinguishing feature of late 19th century riviéres is the replacement of collets by claw settings. The riviére will be offered at auction by Sotheby's Geneva in May for $250,000 - 350,000 USD.